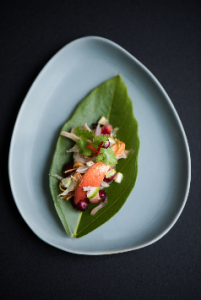 Signature dishes on Chef Pim’s new menu includeentrées such as the Blue Swimmer Crab, Coriander and Picked Garlic on Rice Crackers with Peanuts as well as the Miang of Lobster, Chicken, green Mango, Snake Fruit and Herbs served on Thong-Lang Leaves. 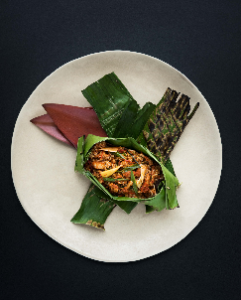 Main courses include the Ember-grilled rice with Sampran Farm Pork and Banana Blossom petals served with Seasoned Crispy Fish. Another firm favourite being the Chiang Mai Larp of Pigeon tossed with Herbs and Crisp Alliums, served with fresh vegetables. nahm’s main space has a warm, honeyed glow with inspiration drawn from Thailand’s fourteenth to eighteenth-century Ayutthaya period. Hence the textured rusty-red brick-stepped columns reminiscent of Ayutthaya temples, and the hand-crafted wooden screens. Every design detail has been attended to, including the tableware. The handpicked selection includes Benjarong bowls from Thai Artisan ‘Pinsuwan Benjarong’ and Celadon plates from local manufacturer ‘Mengrai Kilns’. 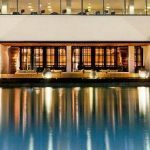 The nahm Experience Package starts from THB 7,360 (Single occupancy) and THB 10,160 (Double occupancy).